Add a level of comfort and style to your hunting vest. With the same durable waxed canvas used across our Sovereign goods, the Upland Vest features two front pouches with magnetic closure for easy access to shells. 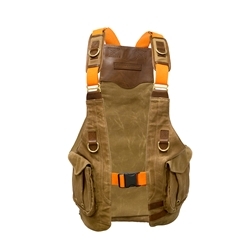 Padded, adjustable shoulder straps and adjustable, elastic threads on the sides allow for custom fit. To top it off, there is a spacious back compartment with waterproof lining to store your birds.